Those that follow the Chipojoblog are familiar with my motto “I strive to become a naturalist.” This motto reflects my view, and the approach used in my lab, that developing an intimate understanding of the ecology and behavior of the organisms we work with is an integral part of our research program. The majority of our "posts" are done with the objective of sharing our observations, made under natural conditions, of the behavior or ecology of anoles, what is commonly labeled as natural history. These observations are extremely valuable as they formed the building blocks for the exploration of new hypotheses. 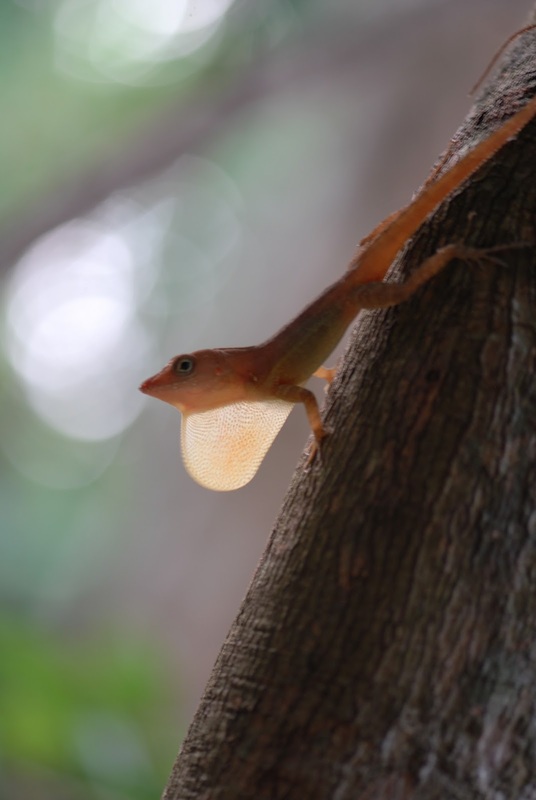 Our most recent paper, co-author with Leo Fleishman, and recently published on Functional Ecology “Whydo Anolis lizard dewlaps glow? An analysis of a translucent visual signal” is a prime example of this approach, in which detailed observations of an organism's general ecology are examined within a theoretical framework to yield novel hypotheses: what I called Experimental Natural History. In the case of this paper the observation happened a long time. So long, that at the time I was a graduate student finishing my work and getting ready to move to Leo’s lab. I was in Cuba collecting data on the ecology of anoles, particularly the community of anoles at Soroa. While at Soroa, I filmed the display of a few species of anoles, including A. homolechis. Anolis homolechis is found in partially shaded forest and has a white dewlap. As shown by the video, the dewlap of A. homolechis appears to “glow.” This effect is so dramatic that the dewlap stands out against the background, giving the impression that it is a light source. When I showed the above video to Leo, he was so impressed that he suggested that we should evaluate the possibility of “fluorescence”, that is, the short wavelengths striking the dewlap were being absorbed and re-emitted as longer wavelengths, thus giving it the perception of a “light bulb”. To make a long story short, that was not the case, and in the process of testing this idea I learned that although lasers are commonly described as monochromatic they are not. In the majority of the cases laser also emit a longer wave peak. This was the end of the potential “fluorescence” effect, but not the end of our quest to understand the mechanism by which dewlaps are able to appear so bright, and if those mechanisms have potential consequences in the ability of the receiver to detect the signal. We conducted a second experiment, showing that light geometry highly contribute to this effect. Below is an illustration of our gadget to test this effect. Basically we simulate the "sun" striking the dewlap from different angles and measured, from the front of the dewlap (reflection) and back of the dewlap (transmission) and measured the radiance spectrum of the dewlap A pdf of the paper entitled "Illumination geometry, detector position and objective determination of animal signal colours in natural light" can be found here. As a side note, this paper is somewhat technical, yet is packed with ideas and a must read for those interested in visual ecology. In a nutshell, dewlaps are quite thin, and not only reflect the light that hits their surfaces, for many dewlaps there is a significant contribution from the light that passes through the dewlap from behind it. This is completely dependent on the light geometry and when transmission is higher than reflection dewlaps tends to appear brighter. But the key finding of our experiment was, that as the light passes through the dewlap the light rays are scattered in all directions from the surface, resulting in a diffuse transmission. 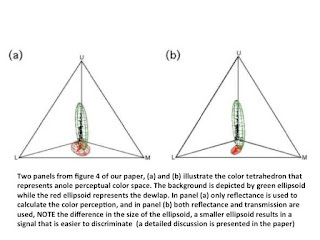 This finding allowed us to propose that in order to predict that dewlap coloration under natural conditions both the reflection and transmission spectrum must be measured and that light geometry can be a major contributor to the appearance of a signal. Male Anolis lineatopus from Jamaica. 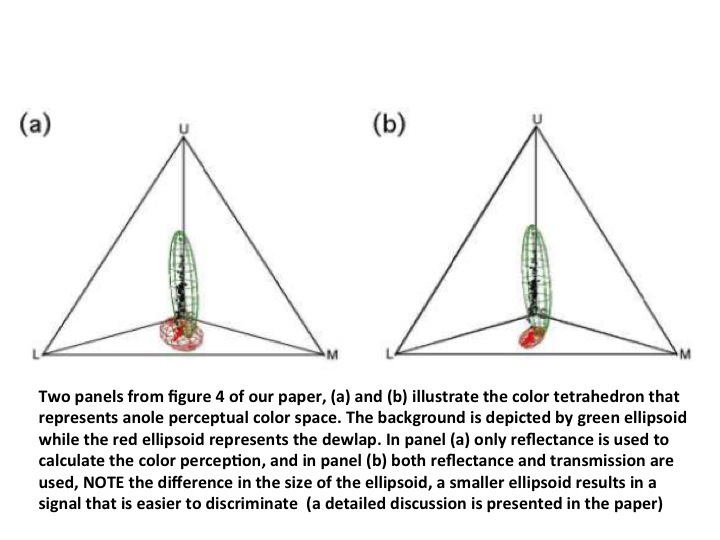 Note how the dewlap coloration is dominated by light striking the dewlap from the back, that is, the dewlap is scattering the light rays in all directions to appear "translucent"
In this paper we showed that the properties of the dewlap to transmit light and to do so by scattering the light rays in all directions, (i.e., to appear “translucent”) greatly increase the signal to noise ratio. The translucent properties result in a signal that is easy to discriminate against the background, by decreasing the amount of noise present in the signal. The figure below illustrates this effect: NOTE how the volume of the red sphere is reduced when light transmission is included in the calculations of the spectral volume of the dewlap (figure b). Also, note how the dewlap doesn’t overlap with the background coloration. The green sphere represents the background coloration. If “a picture is worth a thousand words” I encourage you to see the following video (https://youtu.be/errevFcr01k) which is worth at least twice as much; KUDOS to Holly Steinberg for the masterful narration and to Dave Steinberg for the editing. As a naturalist I hope this paper illustrates the value of natural history. Moreover, it give you a taste of what I called “Experimental Natural History” when observations of an organism's ecology are examined within a theoretical framework, usually by integrating multiple fields, to yield novel hypotheses. If lucky, those novel hypotheses can open new areas for further studies. In this case, transmission is not limited to dewlaps, other signal structures such as fish fin, insect wings, and feathers are also capable of transmitting light. How important is transmission for the efficacy of those signals remains an open question waiting to be tested. Snails, Leaves, Lizards oh My! Leal in the New York Times, again!